"What to do on Phi Phi?" is a common question for those first venturing out to the islands in Thailand. Why is Phi Phi so famous and what makes it such a magnet for so many visitors every year. The number of tour boats and ferries stating in Phuket Krabi and Koh Lanta every day testify to the amount of what there is to do on Phi Phi. The answer to this question is varied and often depends on the type of tourist or traveller you tend to be. However the main attractions are the limestone cliffs that roar out of the aquamarine sea in a vision of unbelievable beauty. The golden sandy Phi Phi beaches contrast with the sea blues and the green mountains to give an experience of nature in the tropics that many label paradise. what many do on Phi Phi is beaches hop around the 25km of island shore line hanging out and enjoying the day, the weather and 29 degree C temperatures in the sea. The main beaches are Maya Bay, The Beach where Leonardo di Caprio shot his famous movie. This is on Phi Phi Ley, perhaps one of Thailand's most dramatic islands. Few travel to Phi Phi without going to the main Phi Phi Don Village where the Phi Phi ferries land, and walking around, there are no cars, experience the majesty of the twin beaches of Tonsai and Loh Dalum. The village itself is a topsy-turvy mix bag of restaurants, cafes, dive shops and shopping, sitting alongside simple guesthouses and local village life itself. 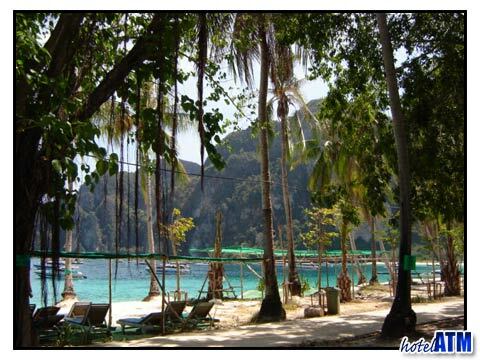 Most Phi Phi resorts are around the main village on the beachfront and along the shore to Long Beach. 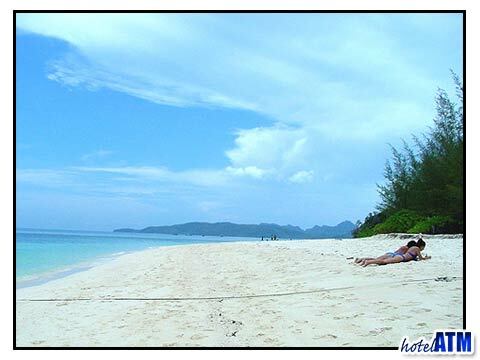 Further north on Loh Bagoa and Laem Tong Beaches you find the quieter accommodation beaches and the best luxury resort. Phi Phi Island is a true diving pleasure. All the marine life you can see in the Indian Ocean can be found here and though it is tidal and more variable in visibility than other Thai dive sites (Similan and Koh Racha) it has wonderfully diverse dive sites from the deep walls of Koh Bida, the Boulder sites of Maya Bay, Shark Point, The Wreck, cave dives and more. Not only that the dive sites start just 5 minutes from the dive pier in the main village. The 20-60m deep Hin Daeng pinnacle dive site is the stand out place for advanced divers with large pelagic marine life like the Whale Shark and Manta Ray a common site in season. Here the visibility is great. This dive site is 45 minutes by speedboat south of Phi Phi Island. Snorkeling is one of the most pleasurable aspects of time spent on the islands. Without the need for PADI courses and just the need to be able to swim you can experience the kaleidoscopic view of the oceans reefs in over 20km of snorkelling reefs. There are many Snorkeling tours on Phi Phi using large cruise boats, fishing boats, longtail boats and speedboats. So however you like to get into nature there is something for everyone. As already mentioned the village is a buzz with great restaurants to try, Don’t forget the fish restaurants, coffee shops cafes and more. The bars and beach bar scene is a fantastic mix of youthful energy, that buzz on the beach is never truly far away. If you want o hang out where it's at try the following venues; Slinky Beach Bar, Dojo Bar and Carlitos.